Opera composers who strive to make their works relevant usually succeed only in making them ephemeral. 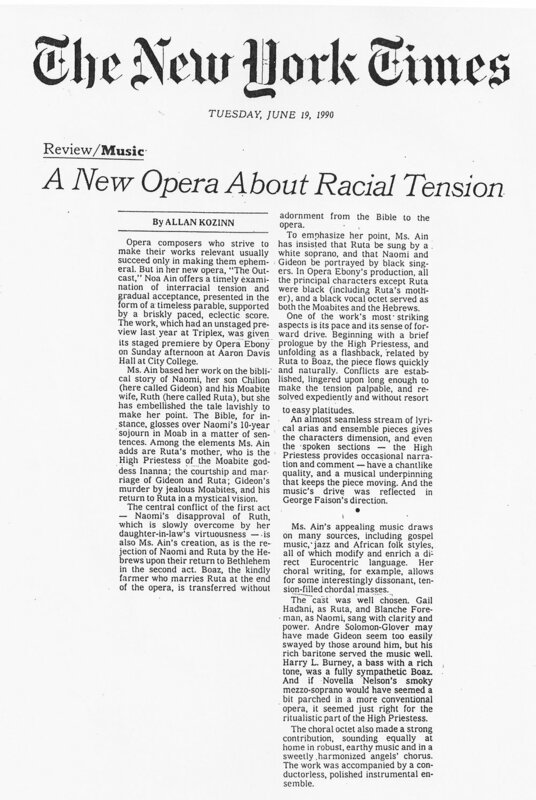 But in her new opera, "The Out­cast," Noa Ain offers a timely exami­nation of interracial tension and gradual acceptance, presented in the form of a timeless parable, supported by a briskly paced, eclectic score. The work, which had an un-staged preview last year at Triplex, was given its staged premiere by Opera Ebony on Sunday afternoon at Aaron Davis Hall at City College. Ms. Ain based her work on the biblical story of Naomi, her son Chilion (here called Gideon) and his Moabite wife, Ruth (here called Ruta), but she has embellished the tale lavishly to make her point. The Bible, for in­ stance, glosses over Naomi's 10-year sojourn in Moab in a matter of sentences. Among the elements Ms. Ain adds are Ruta's mother, who is the High Priestess of the Moabite godess Inanna; the courtship and marriage of Gideon and Ruta; Gideon's murder by jealous Moabites, and his return to Ruta in a mystical vision. The central conflict of the first act - Naomi's disapproval of Ruth, which is slowly overcome by her daughter-in-law's virtuousness - is also Ms. Ain's creation, as is the re­jection of Naomi and Ruta by the He­brews upon their return to Bethlehem in the second act. Boaz, the kindly farmer who marries Ruta at the end of the opera, is transferred without adornment from the Bible to the opera. To emphasize her point, Ms. Ain has insisted that Ruta be sung by a white soprano, and that Naomi and Gideon be portrayed by black sing­ers. 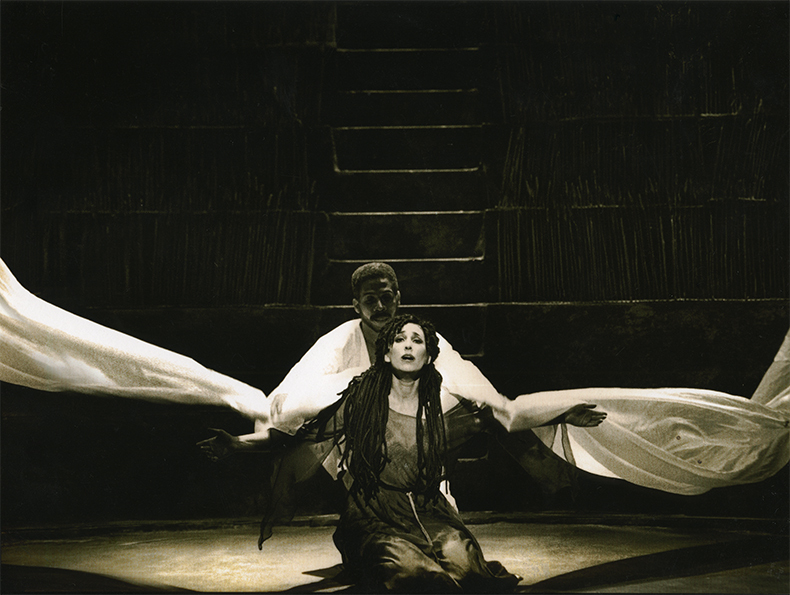 In Opera Ebony's production, all the principal characters except Ruta were black (including Ruta's moth­er), and a black vocal octet served as both the Moabites and the Hebrews. One of the work's most striking aspects is its pace and its sense of for­ ward drive. Beginning with a brief prologue by the High Priestess, and unfolding as a flashback, related by Ruta to Boaz, the piece flows quickly and naturally. Conflicts are estab­lished, lingered upon long enough to make the tension palpable, and re­solved expediently and without resort to easy platitudes. An almost seamless stream of lyrical arias and ensemble pieces gives the characters dimension, and even the spoken sections - the High Priestess provides occasional narration and comment - have a chantlike quality, and a musical underpinning that keeps the piece moving. And the music's drive was reflected in George Faison's direction. Ms. Ain's appealing music draws on many sources, including gospel music, jazz and African folk styles, all of which modify and enrich a direct Eurocentric language. Her choral writing, for example, allows for some interestingly dissonant, ten­sion-filled chordal masses. The cast was well chosen. Gail Hadani, as Ruta, and Blanche Foreman, as Naomi, sang with clarity and power. Andre Solomon-Glover may have made Gideon seem too easily swayed by those around him, but his rich baritone served the music well. Harry L. Burney, a bass with a rich tone, was a fully sympathetic Boaz. And if Novella Nelson's smoky mezzo-soprano would have seemed a bit parched in a more conventional opera, it seemed just right for the ritualistic part of the High Priestess. The choral octet also made a strong contribution, sounding equally at home in robust, earthy music and in a sweetly harmonized angels' chorus. The work was accompanied by a con­ductorless, polished instrumental en­semble. NEW YORK — BORN to Orthodox Jewish parents in Brooklyn, Noa Ain began looking early in life for ways to broaden her experience. Yet when her Polish Catholic fiance asked her to move with him to Warsaw in 1975, she felt her resolve slipping. Ain did not take easily to her new environment. Adults called her a gypsy, and children laughed at her. But after a dispiriting first year, she began composing a new work, called ''The Outcast,'' based loosely on the Biblical story of Ruth. Conceived as a jazz opera, it tells of a pagan woman (Ain calls her Ruta) whose marriage to a Jewish man renders her a stranger among both her own tribe and her adopted one. ''I felt that Ruth's journey was very much my own,'' she said at a rehearsal last week. Opera Ebony, an African-American company based in New York, will perform the work at the Brooklyn Academy of Music April 26, 28, and 29. With a classical score that draws heavily on gospel and jazz, ''The Outcast'' suits Opera Ebony well. Many members of the 21-year-old company grew up singing spirituals in black churches before training in operatic voice. Gockley is not alone in his admiration of Ain's work. She has won 10 ASCAP awards to date, and in 1993 the American Music Theater Festival gave her its annual Stephen Sondheim Award for innovative music-theater work. Such freshness is sorely needed in the world of opera, an art form that Gockley and others believe has alienated much of the American public. ''The Outcast'' breaks solidly from operatic tradition with both its subject matter and musical roots. The tale begins when Ruta (soprano Clare Gormley) convinces her people to spare a family of foreigners from persecution. Ruta later marries one of the strangers, a Jewish man named Gideon (baritone Lawrence Craig), but her mother, the pagan priestess Ar (jazz singer Ebony Jo-Ann), has him murdered. lienated by this deadly prejudice, Ruta renounces her heritage and goes with Gideon's mother, Naomi (mezzo-soprano Elvira Green), to live in Bethlehem. There they meet Boaz (bass-baritone Kevin Deas), an Israelite who shelters them from his intolerant and suspicious neighbors. Ruth's is one of the world's oldest stories, Ain says, but also the most current. ''Cultural conflict is the major problem of our day,'' she says. Indeed, one doesn't have to travel far from the theater to appreciate the relevance of this work. Three subway stops away is the Brooklyn neighborhood of Crown Heights, where an African-American schoolboy and a Jewish scholar died when racial tensions erupted in violence four summers ago. Where ''The Outcast'' differs most from traditional opera is in its use of improvisation. Both Ain and Wayne Sanders, Opera Ebony's music director and co-founder, have encouraged the production's 12 singers and six musicians to depart from the score when the spirit moves them. A distinct voice in the production is that of soprano Clare Gormley. ''Her voice has a creamy, beautiful texture,'' says Gail Robinson, director of the Metropolitan Opera's Young Artists Development Program, where Gormley just completed a two-year fellowship. Ain approaches the story not as a Biblical scholar, but as an observer of society. If ''The Outcast'' has a message, it is the inherent value of cultural interchange. When Ruta converts to Judaism, both are changed for the better: Judaism gains a model of tolerance and Ruta finds a home with Boaz, whom she marries. Ain's sojourn in Poland turned out to be a sort of homecoming. At first she felt like a stranger, but her outlook changed upon learning that her family had lived in Poland for 500 years. This discovery, she says, led her to conclude that other cultures are not always as foreign as they seem.